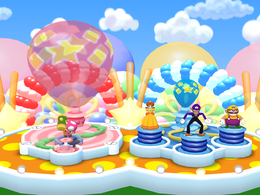 Pop Star is a 1-vs-3 minigame in Mario Party 6. Its name comes from the term "pop star", which refers to a famous person associated with pop music. The difference between day and night is when the balloon blows up. Bubbles come out of the balloon at daytime and Stars come out of the balloon at nightime. The introduction shows each player inflating their balloon a bit to start with. Players attempt to inflate their balloons to the point where theirs pops first. 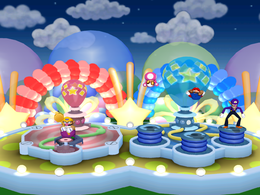 The three players work together to pop their balloon by ground pounding with double on some pumps, while the other player tries to pop his or her balloon by hammering on a pump by repeatedly pressing . The camera zooms in on the winner(s). They then perform their victory animation. Rules – "One player swings a hammer while the other three ground-pound to blow up a balloon. Whoever pops their balloon first wins!" Advice – "The players in the team of three will pump more air if they ground pound from the highest point of their jump." This page was last edited on December 18, 2017, at 09:52.